Cody DeGroff couldn't believe it. The Massachusetts lifeguard was using his new drone when he saw it, the great white shark off the coast of Nauset Beach on Sunday. DeGroff's eyes only got bigger when he panned the drone up and saw the shark swimming straight for a paddleboarder. "I was like, 'holy crap!'" he said. "It was crazy." 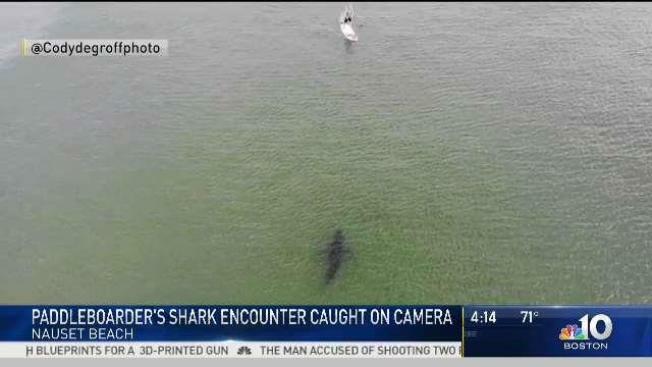 DeGroff continued to take pictures of the shark as it swam toward the paddleboarder, eventually, the shark doing a half-turn once it passed the man. "I was having just the greatest time," Roger Freeman said. "It was the perfect Cape Cod summer morning." Freeman said Monday night that he had no idea that shark was swimming right toward him. "Having grown up in the 'Jaws' age, you think about these things happening or wonder about what's lurking below, but to see it on a tape is really something," he added. It wasn't until Freeman got back on land did he realize his close encounter. "I came in, and a guy waved me over, and he was like, 'dude, you got to check this out, my buddy took a drone shot, look at this!'" Freeman recounted. Freeman said in the future he'll probably paddleboard with someone else. But for now, he has quite the story to tell — and the pictures to prove it. "It's awesome I lived!" he said.